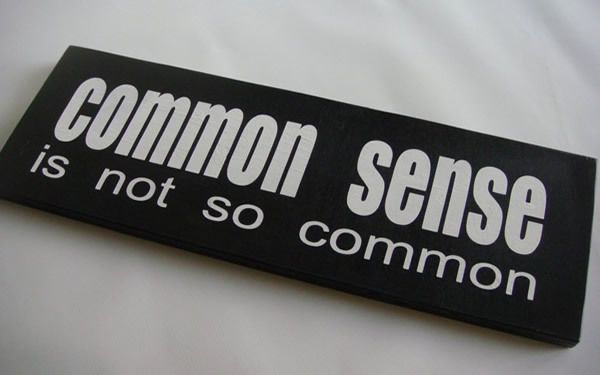 Why Do You Not Use Your Common Sense? When it comes to use common sense with open heart without prejudice about "true religion" the majority of non-Muslims and Atheists do not use their intelligence, wisdom and common sense no matter what education they have and they start behaving as an intransigent, stubborn and stupid. O, Atheists and Non-Muslims, why do you not use your common sense? If Holy Quran is a false book, then book, then why are there millions of Muslim men, women, little boys and girls in whole world who have saved the whole Holy Quran in their hearts and they recite it without seeing in it? And, why is there not any Non-Muslim in Christians, Jews, Hindus, etc who saved his/her religious book in heart and can recite it without seeing in it? If Islam is a false religion, then why only Muslims have a unique Holy water called 'ZAM ZAM' near Holy Kaaba in Holy Mecca, but why do not Non-Muslims have any Holy water like 'ZAM ZAM' in the world? If Muhammad (PBUH) is a false prophet, then how had he split the moon in two pieces on demand of the pagans of Holy Mecca as it has been described in Holy Qura, Hadith and the scientists also have proven the sign of moon split? If Islam is a false religion, Holy Quran is a false book and Muhammad (PBUH) is a false prophet, then why the Earth did not decay millions of dead bodies of Muslim martyrs, Companions of Muhammad (PBUH), Muslim saints and true Muslims in their graves since centuries and years? Almighty Allah had said 1400 years ago and now you can see the truth of His saying in fresh dead bodies with fresh blood of Muslim Martyrs who are preserved since centuries and years. Allah had said in Holy Quran Surah no 41, verse no 53:"We will show them Our signs in the universe and within their own beings until it will become manifest to them that it is the truth. Is it not enough about your Lord that He is witness to everything?" So, please leave the religious intransigence and accept the truth of Islam. I have given here the addresses of some fresh dead bodies of Muslim Martyrs, saints and true Muslims that are preserved since centuries and years. 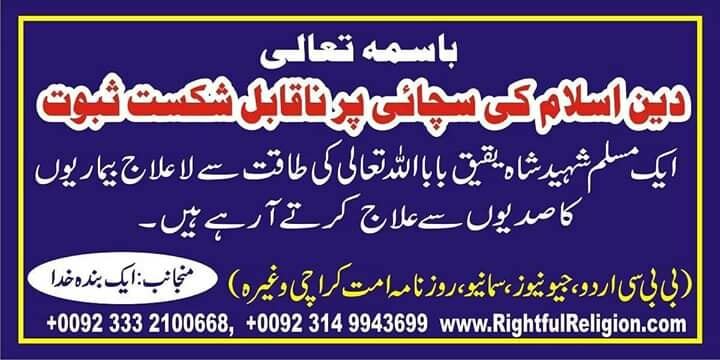 So if you want to verify about them, then you should go at these addresses and research yourself or trust on our research and accept the truth of Islam and leave the religious intransigence. Fresh dead body with fresh blood of Mufti Ateequr Rahman in graveyard of Jamia Binoria near site police station, site area, Karachi, Pakistan. Fresh dead bodies with fresh blood of two companions (Huzaifah bin Yamaan and Abdullah bin Jabir) of last prophet Muhammad (pbuh) in mosque 'salman' in Baghdad, Iraq. Fresh dead body of a true Muslim in Zulfaqqar cemetery in Bhainsa, Andhra Pardesh, India.4) More than five fresh dead bodies of true Muslims in cemeteries of Gujjar Khan, a district of Rawalpindi, Islamabad, Pakistan. More than sixty five fresh dead bodies of Muslim Martyrs and companions of last prophet Muhammad (pbuh) in cemetery of Ohud in Holy Makkah, Saudi Arabia. Fresh dead body of a true Muslim women named Qamrun Nisa D/o Muhammad Zahur in cemetery of 11-D, North Karachi, Pakistan. Fresh dead body of Moulana Aashiq Elahi Merathi in cemetery of Jannatul Baqi in Madina, Saudi Arabia. Now, I ask a question to all Atheists and Non-Muslims of world that if there is no God (creator) then WHO ordered the Earth to preserve the dead bodies of Muslim Martyrs, companions of last prophet Muhammad (pbuh), Muslim saints and true Muslims from decay since centuries and years? And, WHY there are thousands of fresh dead bodies with fresh blood of Muslim martyrs under the Earth in their graves without used any chemicals since the time of last prophet Muhammad (pbuh)? For more details regarding verification methods, please study here. Note: "Incorruptible" dead bodies words are used in Christianity, Buddhism and some other religions that their followers use to declare as divine sign on truth of their religion, but the true fact is that they all are corrupted dead bodies with chemicals used to change the look of face/hands, etc. They are not in sleep-like fresh condition and fresh blood is not in their dead bodies. In other words, human intervention were used to modify them so they are not divine at all.